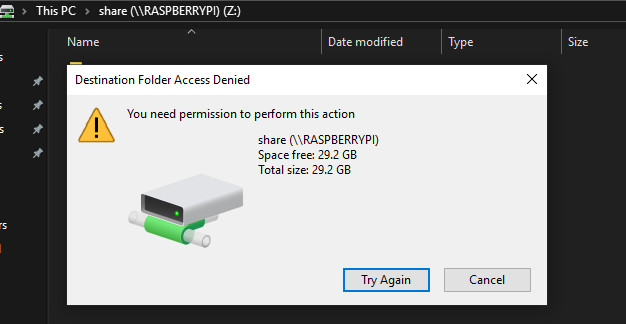 I have samba installed on the Pi and mounted a usb drive, I can access it on windows but I cannot write to it, I suspect it’s because I need to chmod the drive, but FAT32 does not support permissions, so what are my options here? Successfully mapped on windows 10, but cannot create or delete files only read. As you say you can't write to the device, I assume that reading works. There are two approaches to fix this. You can use this to give permissions to everybody, dmask=000 and fmask=111. Files don't need exec permission. 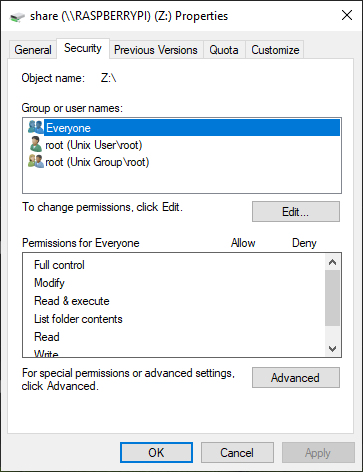 Make sure Samba has the permissions to access the file system. In smb.conf, you can use the force user (and force group) option. By default the file system will be owned by root, so use with caution and only for the FAT file system. This specifies a UNIX user name that will be assigned as the default user for all users connecting to this service. This is useful for sharing files. You should also use it carefully as using it incorrectly can cause security problems. This user name only gets used once a connection is established. Thus clients still need to connect as a valid user and supply a valid password. Once connected, all file operations will be performed as the "forced user", no matter what username the client connected as. This can be very useful. Not the answer you're looking for? Browse other questions tagged raspbian networking raspbian-jessie samba or ask your own question.